The simplest way to tackle this issue is to draw up a timetable or a schedule of study. Take a typical week, look at each day in some detail, and make a note of those slots of time which are free – or can be made free. Try to create regular periods of an hour or more. It is better to study for an hour on each day of the week than to study for seven hours on one day at the weekend. Check your sleep requirements. Many people find that they can cut back to six or seven hours sleep a night without suffering any feelings of tiredness during the day. If by doing this you save just one hour per day, this adds up to an extra seven hours a week. Develop regular study habits. You will learn more and remember what you learn if you work in regular periods of study rather than occasional spurts of enthusiasm punctuated by lay-offs. Studying is rather like physical exercise: you need regular training to maintain a state of mental fitness. Create a realistic and modest schedule of work , then stick to it. This way you will achieve your aims. This will be much better than having one that is over-ambitious, which might lead to your failing. If you overstretch yourself too much, this will simply make you feel demoralised. Be prepared for some disruption to your lifestyle at first. Then, as you become more accustomed to study you should discover that you are able to study for longer and longer periods. This will be partly due to practice and the development of your skills. It may also be (if you have chosen your subject well) out of the sheer enjoyment that learning can bring. The exact amount of time you will need depends on the type of course you are pursuing. On average, you might allow ten to fifteen hours per week for one module of a part-time degree (say, a typical Open University course). Twenty-five or thirty hours might be realistic if you were studying on a full time degree course (this is in addition to your attendance at lectures and seminars). Many people make good use of existing time by combining some form of study with daily life. For instance, it is possible to listen to pre-recorded audio-cassette tapes whilst driving to and from work. For those using buses and trains, the travel time can be used for reading. Even a household task such as ironing can be done whilst listening to tapes or the radio. Take a lead from the Walkman-users. For those people who need to practice their foreign language vocabulary, simply walking down the street can be used as study time if you listen to tapes. You could also use this strategy to listen to radio programmes or tapes appropriate to your subject. Always take a book. Whatever you do in daily life, there are usually short periods of dead time which could otherwise be spent reading. Waiting for a bus, a gap between classes, a lunch break: any of these opportunities can be used to keep up with your reading. Don’t waste time: even short periods can be put to use. Take a book wherever you go. At first you might feel slightly odd, reading in public, but you will notice how other people involved in study and teaching very often carry around a book or a magazine. They read over coffee, standing in a queue, or whilst they are waiting for someone. Get used to the idea that this is perfectly normal and an efficient use of your time. you need to spend time alone, studying. To create more good quality study time in crowded domestic circumstances, you may need to get up early in the morning or stay up late at night. If you can do this you are less likely to be disturbed by the presence of others. Some people are at their best in the early morning; others work better at night. Decide which is best for you – and don’t let other people make you feel guilty about your choice. You might need to get used to the idea that you will be studying whilst other people are relaxing or socialising. At first this could make you feel something of an outsider. But remember that many other people are students too, that studying is a perfectly normal activity, and that it can bring its own rewards and satisfactions. For people living among large busy families or in cramped housing (or both) these might seem like utopian conditions. However, many students manage to arrange time and space for themselves by being inventive and determined. Be prepared to make the effort. If possible, keep all your study materials together in the area you will be using. Even if you do not have the luxury of your own desk and study, you can keep all your notes, text books, and papers stored in a box which is brought out for each study session. Be prepared for a certain amount of discomfort or hardship. You may have to work at a kitchen table or in a spare room which is not comfortably furnished. You may have to take your books to the local library and work there whilst your family or friends are relaxing in comfort. Keep in mind that you have opted to pursue your studies which (hopefully) will bring their own rewards. Try to minimise the distractions you may have to face whilst studying. Don’t try to do any work when you are surrounded by other people. Ask the people you might live with to grant you a right to free time. Keep well away from the telephone. Whatever you do, never try to work in a room where a television set is switched on. Concentration is impossible in such circumstances. Beginners should start with short periods of study which are then gradually lengthened. Those new to studying might find it difficult to concentrate for long stretches at first. However, as you become more experienced and more interested in your subject, your ability to concentrate will improve. Even experienced students study more effectively if their work is punctuated by occasional short breaks. You should allow yourself a mental breather from time to time. However, it is important that you have the self-discipline to keep the breaks short. Go straight back to your task when the break is over. Do not try reading and studying when you are very tired. In these circumstances, you will not retain much of what passes before your eyes. [For most people this is likely to be late at night.] You are using up time which could be spent more profitably. It would be much better to go to bed and start afresh the next day. Good time management also includes good study techniques and housekeeping practices. You will waste less time if your notes are well organised. Work with all your text books on the table. 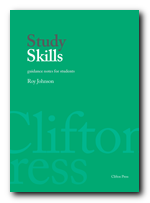 Keep a record of the course outline so that you can see the context of your studies. Have a good dictionary and works of reference close to hand. far more efficient if your study is purposeful. That is, make a deliberate effort to be conscious of what you are doing, which topics you plan to cover, and where you are up to in your study plan. Even though copying out long passages from a book might help you to digest its arguments, it is doubtful that this will be time efficiently spent. Make photocopies instead. You can decide later if it is important or not. Notes composed in your own words will be of more use to you, because in making them you will be selecting and digesting the original information. For the vast majority of people, more free time will be available simply by watching less television. This is not to suggest that you become a puritanical killjoy, but the average person in Britain watches television for twenty-five hours per week. Just cutting this in half would release enough time to undertake a part-time degree. Don’t read or write in gloomy conditions. This will cause eye-strain, headaches, or drowsiness. Have a good strong light source (preferably natural light) directed onto the page. Read near a window. At night, use a lamp which casts a strong light onto your workdesk or table. Use standard materials – such as A4 notepaper, folders, ring-binders, and document holders. Most educational materials are now produced in this international standard format. 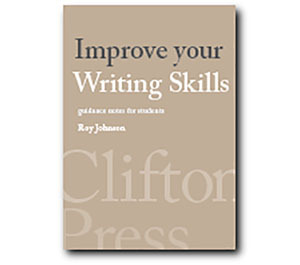 Don’t use small spiral-bound notepads or letter-sized notepaper. Notes recorded on such paper are easily lost. The neat and efficient organisation of your study materials will actually save time. Keep a simple filing system. Use a separate folder for each subject – or keep your notes in well-distinguished sections. Number your pages. Use colour coding. Loose-leaf folders are possibly the most efficient because you can add materials easily. Get used to using lots of paper. It is not a good idea to cram as much information as possible onto one sheet of paper. This is false economy. The retrieval of this information will be less efficient because it is too tightly packed together. Let your work breathe. Use plenty of ‘white space’.